We had been wanting to make our way to a Brooklyn Cyclones game during the 2010 season, but with the way our schedule worked out most of the season we just couldn't find time. Down to the wire (the last game of the season for Brooklyn), we finally found time to get there! In fact, this was our fourth team in the Mets organization in a week. To bad Savannah and St. Lucie weren't closer, or we could have hit them all! We left early enough from home to get to Coney Island with some time to spare. We parked at the ballpark, grabbed a couple of slices of pizza from the pizzeria right there at the park, and then went walking down the boardwalk. 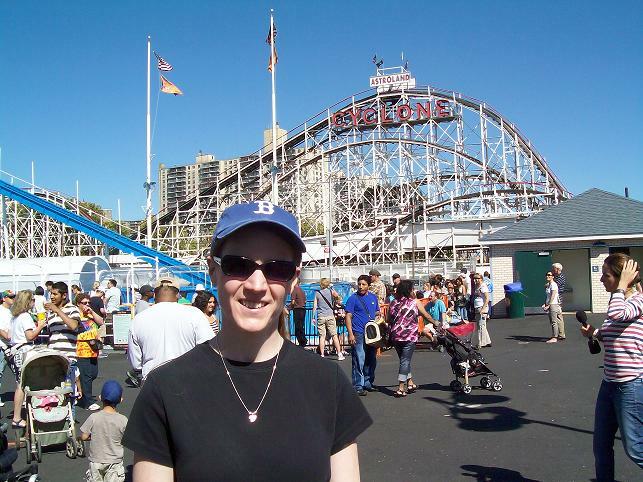 We stopped at what was once Astroland to see the Cyclone (for some reason, it wasn't running that day), as well as looked at the BEACH (next to the ocean). After strolling for a bit, we headed back to the park. Had decent aisle seats along the third base line, although the sun wasn't really in the right 'spot' until around 6:15 when we were shaded from it - and the folks in spots on the first base side were now shielding their eyes! The home team won out, with one player - CODY VAUGHN - being the standout amongst all the rest and a player I'm sure we'll see in Binghamton someday soon. We wanted to grab some dinner after the game, so Jill worked her magic on the Android and found yet another keeper in Newark. Mompou Tapas on Ferry Street in Newark is where we stopped - good food, eh, okay service as well. After dinner we drove home. The Brooklyn Cyclones finished off the regular season on a high note as they defeated the Tri-City Valley Cats on Sunday night by a score of 6-5. Brooklyn (51-24) ended the season just one win shy of the single-season win record, set in the inaugural 2001 season. The team's 30-8 record at home ties a franchise high, also set by the 2001 team. Brooklyn's bats scored six runs on five hits, relying mostly on the long ball to push them past the Valley Cats. 2B J.B. Brown launched a ball over the right field fence in the first inning, giving the Cyclones a 2-0 lead and RF Cory Vaughn launched himself into the Cyclones' record books with his 14th home run of the season -- a two run shot in the third inning that set a new franchise record and earned Vaughn a rare MCU Park curtain call. Both Brown and Vaughn went 2-for-3 on the day, each with two runs and two RBI. CF Darrell Ceciliani registered another multi-hit game, going 2-for-3 with one RBI and one run. His .351 season average also set a new franchise record, and Ceciliani became the first Cyclone ever to win the NYPL batting title. DH Joe Bonfe, C Juan Centeno, and LF Will Cherry rounded out Brooklyn's offense, registering one hit apiece to bring their season averages to .326, .371, and .234, respectively. The Cyclones used a total of six pitchers in the win, surrendering five runs on 11 hits while striking out eight. RHP A.J. Pinera was limited to two innings, allowing one run on two hits while striking out one. RHP Samuel Taveras came on in the third, tossing two scoreless frames and striking out three. RHP Nelson Pereira allowed four runs (three earned) on five hits while striking out one over 0.2 innings of work, leaving with two men on. RHP Wes Wrenn (5-5) came on to retire the last batter in the fifth inning and toss a scoreless sixth to earn himself a win, and bring his win-loss record to .500. LHP T.J. Chism made just his fifth appearance for Brooklyn tossing a scoreless seventh and eighth innings, surrendering just one hit while striking out three. RHP Daniel Carela came on in the ninth inning to preserve the one run lead without allowing a hit for his second save of the season. The Bank of America New York-Penn League Playoffs start on Tuesday, and the Cyclones will host at least one home playoff game on Wednesday, September 8th. Brooklyn could host as many as four games.